If you live in New York City, you’ve probably noticed a couple mobile businesses in your neighborhood. Take food trucks, for example. You can smell the Chicken & Waffles long before you round the corner. The Halal Guys get swarmed by massive lines over lunchtime—hard to miss. Ice cream trucks are forever defined by that age-old jingle. But there is one groundbreaking mobile business you don’t see, hear, or smell… hardly at all. (Certainly, I never had.) Let’s put it this way: This mobile business is intentionally silent. In fact, they’re only doing their job if they don’t make a peep. Last week, I spent some time with BeTime founder Carla Hammond, and a BeTime instructor to check out the space. BeTime’s zen journey begins in an unlikely place: on a state-of-the-art, masterfully-designed… bus. But Carla had a hard time finding a bus company that would even consider selling to her. She found a workaround in a former passenger bus in rural Texas. Carla then drove the bus to Miami, where it was refurbished into what exists today. The bus walls are 100% soundproof to block out any honking or noise from New York City’s streets just inches away—you literally hear nothing except your own breath. The funky patterns on the walls depict fractals found in nature. The large circle in the back represents the third eye, AKA the center of concentration. The designers chose interior mirrored panels to achieve a more spacious, illuminated appearance. Finally, a six-herb aroma was created specifically for the brand to be diffused throughout the space during sessions. Overall, BeTime is the ultimate Manhattan escape—or should I say, the ultimate escape from Manhattan. The class itself, not quite running at full capacity just yet, is led by a live, in-person instructor at the helm of the bus. He or she guides you through entry-level meditation. You sit shoeless atop a pillowy mat, and you follow your instructor’s guided breaths. Based on the kind of practice he is leading that day, he changes the color of the lights, the music, and therefore the tone of the session. He told me the real value of the meditation session happens not when you’re some expert yogi who can immediately slip into zen, but rather when you catch yourself thinking and then allow yourself to return to your breath. Seems intimidating at first, but it is far from it. The BeTime crowd is open to everyone. Mothers join with their kids for quiet time, and people come from work during lunch for 15-minute meditation sessions. BeTime is definitely not exclusive to yogis. Some info on logistics: A 30-minute class costs $22. A 15-minute class costs $11. But for you, eager BeTime newbie, you can try either class for $10. 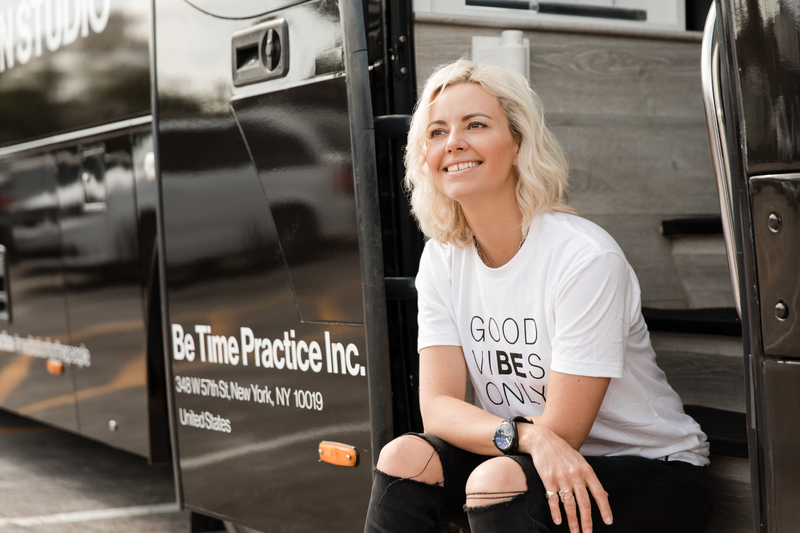 BeTime also hosts “Open Space,” a designated 45-minute time slot where you can walk onto the bus and just chill (read, nap, meditate on your own, whatever). But for me, and for the countless other daily meditators, BeTime is now a space where I can take a breather and escape the hustle and bustle—without the pressure of meditation as this unattainable, unachievable thing.